In part two of my interview with Scott Fortner – owner of The Marilyn Monroe Collection – Scott talks more about his collection, bidding at auctions and how he became an integral part of the longest running Marilyn Monroe fanclub, Marilyn Remembered. When was the first time you saw something of Marilyn’s in person and what was it? Well that’s an interesting story. 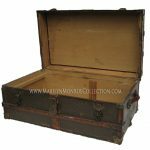 The first time I even made a connection between Marilyn and her personal possessions was when I saw her trunk that was filled with her personal items in the Marilyn Monroe Encyclopedia by Adam Victor. The trunk had been auctioned by Christie’s in 1995. 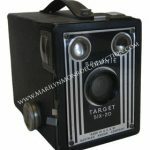 I just thought, “Man, that is so cool!” And, quite luckily, that trunk and many of its contents, including Marilyn’s personal childhood Brownie camera, are part of my collection today. The very first time I ever saw something that she owned in person just happened to be Marilyn’s house in Brentwood. I was stationed in Camp Pendleton when I was in the Marines and drove up to LA one weekend just to see her house. That was in the early ‘90s. Have you ever lost at auction? Indeed I have. I lose more than I win! 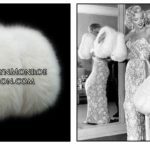 The biggest loss for me was Marilyn’s white fox stole, which happens to be a matched set with the white fox muff in my collection. She wore them together to the world premiere of “How to Marry a Millionaire.” It came up for auction in 2006. I bid up to $20,000.00. It sold for $70,000.00. What was your most exciting win? That’s a question I’ve never been asked before! Again, very hard to say because each win is very exciting. I was ecstatic over winning the green pucci, the maternity dress, and the wool jacket. The “scariest” win ever was back in 2007. 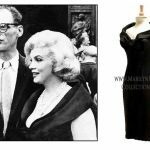 I was at Bonhams in Los Angeles, wanting to win a black cocktail dress of Marilyn’s. I raised my paddle to bid but the auctioneer didn’t see me and nearly closed the lot without recognizing that I was bidding on the item. People in the audience were actually yelling at him and pointing at me to get him to notice. Luckily he saw me before he dropped the gavel, and I ultimately won the dress. The black cocktail dress that nearly wasn’t won! You have a lot of paper items (bills, receipts etc. What draws you to those in particular? This relates to being interested in Marilyn the person, not just Marilyn the celebrity. Through the documents you can figure out and discover so many things. Where she was on what days, who was writing her letters, what she spent her money on, etc. I find it utterly fascinating. You can piece together certain periods of her life, just through her files. 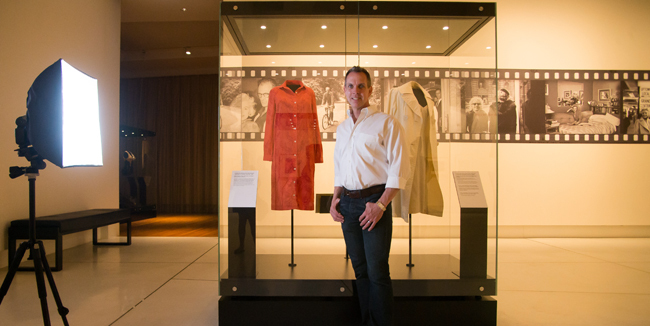 How did you meet Greg (Schreiner – President of MR) and get involved with Marilyn Remembered? I met Greg through Jill Adams probably over ten years ago now. I learned more about all of the Marilyn groups and just organically became involved. I help him with all of the events for the club, sending out member notices, helping with the website, etc. It’s still amazing to me to realize that I’m part of a group holding the actual memorial service for Marilyn. It’s “too close” to believe. Have you guys ever gone after the same thing at auction? Yes, I think we have accidentally gone after the same item. Usually we talk in advance when a big auction comes up to make sure we don’t bid against each other. We’re very good friends, so when something comes up we are both interested in we always work it out. Regardless of who wins, we both take comfort in knowing that the item will rest in either of our collections. Would you ever consider selling your collection? I’m asked often about selling items from my collection, and my response is always, “I’m a collector, not a dealer. I don’t sell items in my collection.” (One time someone who asked actually called me “greedy” because I wouldn’t sell her a Marilyn Monroe signed check.) I’m not sure what the future may hold for the Marilyn Monroe Collection, but for now it’s staying right where it is, and I’ll continue to pursue opportunities to share it with the world via exhibitions.